"Passion - that is the key in Interior / Exterior: the urge to beautify and capture reality and to inspire others." 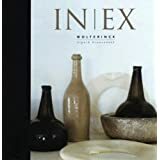 This is an excerpt taken from the book: INEX by Wolterinck. It is one of my favourite books as it features the interiors of homes and shows how the surrounding gardens have been designed to compliment the interiors, creating a total lifestyle concept. This concept is especially more relevant at this time of year when the weather is warm and invites us to spend more time outdoors, thereby extending our useable living spaces. In 1986 Marcel Wolterinck opened a flower shop in the village of Lauren, Holland. His concern for perfection and versatility later resulted in his own furniture range and his passion developed for incorporating the interior of the home with the gardens. The above pictures are part of the garden that surrounds an updated 70's house. Both the garden and the house breathe an Oriental atmosphere. The garden by the bamboo planting around the house, and a Japanese touch is provided by the oak fence which turns gray when weathered. The garden fountain is lead produced by W, and the table in the upper left is a work of art in bronze by the Dutch Sculptor, Huub Kortekaas. The garden chairs are teak and metal. This Provencal Villa (above and below) is situated in St. Tropez. where the emphasis is placed on the exterior life. This is expressed in an outdoor room and outdoor terraces. How very pleasant to sit at the large, wooden table with a zinc base underneath the pergola overgrown with Wisteria. The presence of an outdoor kitchen provides an additional dimension to being outdoors and can be used as an exterior fireplace lit on summer evenings. The planting is a combination of old and new. An age-old olive tree dominates the view (below) and is surrounded by a row of box trees and a wealth of plants such as Santolina, Pittosporum, Senecio, Helichrysum, Laurus nobilis, lavender, thyme, and Westringia fruticosa, all creating a subtle interplay of greens and grays and a perfect match for the various local types of stone. Paradise in Algrave: This beautiful villa (above) is located in Portugal. Wolternick arranged the seating areas surrounding the villa like rooms. The floor lamps, tables, and chairs with cloth upholstery have been assigned a permanent place in these comfortable outdoor areas. Taste and rhythm also apply to the exterior kitchen with its fireplace to grill dishes. Meals can be prepared on the worktop that flanks the fireplace on either side. At right angles with the fireplace is a bold U-shaped zinc table surrounded by delicate director's chairs. The above photos are part of a 20-hectare estate in Bremen, northwestern Germany. The 16th century farmhouse on the estate is surrounded by ancient trees and hedges. The farmhouse court, where horses once stood, was all stone, but was given an intimate character by Wolterinck by means of 60 year old beech hedges, walls, and trained box trees. The garden has many exotic varieties of plants. "The people who used to live on estates like these traveled extensively and brought back with them plants from distant places. This is how many exotic varieties ended up here, like Brugmansia, Hibiscus trees, Agapanthus, lemon trees, figs and Plumbagos. In summer these are put outside in pots, in autumn they find shelter in the orangery". The teak bench from the Lister Collection in the top right picture is in the style of the English Architect, Sir Edwin Lutyens (1869–1944) who collaborated with Gertrude Jekyll the renowned English artist and gardener. What is your most favourite garden? What makes a garden special to you? I love the outdoor water fountain in the second grouping of pictures. Lovely! Thanks for sharing these fantastic photos. I think the most important thing about a garden is being able to have a sense of tranquility and creating a space where you can escape from everything. It's also important to create a space that can be used for entertaining; nothing better than an outdoor dinner party on a hot summers night. I love them, there are so many different ones I love formal gardens and informal ones just the same. One of the nicest here around is located at Wave Hill, an old estate in the Bronx,NY. My own garden is small, but a constant joy and we love to fumble around in it, I feel it is such incredible connection to nature and to plant and see things grow and to care for it is a wonderful expirience, especially for our children. Water features make a garden special for me, it does not have to be a pool. I love the sound of water! Provencal Villa is my favorite. It's because of it's history of family and sharing generational celebrations. Villages can become family and then harvest time becomes a family celbration as well. Gardens are our mini vacations for an hour, full day or lifetime. We choose! Beautiful. Outdoor living space inspiration for sure! What a great post Patricia...thanks so much. I love the teak bench, and the first pic of the figs with the weathered wood is so beautfiul. Hi Patricia! I love the European Gardens with a mix of contemporary influence! My own garden is a mix of citrus, palms, bamboo, jasmine and gardenia. I have incorporated an outdoor fireplace, stone floors and comfy seating! Lots of candles and delicious tapas and spanish wine! Oh Patricia what a wonderful post. You brought back to life so many memories for me. The photos are gorgeous! The New York Botanical Garden is my favorite garden. It holds so many wonderful memories for me. I can still remember visiting with my parents, brothers and sisters and teachers on many school trips. I even remember having a birthday party there. The gardens are spectacular. I haven't been there in at least ten years but I can still remember walking through the rose garden with the sweet scent of roses all around me. I can close my eyes and it's like I am there again. Passion. Passione. Assolutamente si! living in Italy, passione is part of my daily vocabulary. What a passionate blog post, Patricia. Stupendo!!! I searched my computer memory. I remember a day (a loooong time ago) in the White garden of Sissinghurst. I can still recall, and I am still passionate about white. It's raining and I am giving myself permission to take a day off from the garden...by looking at your beautiful garden pictures! I think gardens should reflect the owner's passion—how it reflects the house's architecture has to be secondary. It's like buying furniture that you love and you'll find a place for it kind of design. I'm aiming for "zones" like me: a backyard of rooms for different purposes from meditating to dining, a small area for a romantic English garden (curb my enthusiasm) and front yard that offers structure year-round. It's my newest and it's my tribute to fall and winter. Gardening is the best way to renew your soul and thanks for the attention you give it. Wow, these gardens are GORGEOUS!!! They put my humble little suburban backyard to shame!!! I like the gardens in the first and second sets of pictures best. I love the pergola in the Villa garden. I hope to add a pergola to our deck one day. What makes a garden special to me is filling it with flowers and colours that I love -- bright pink impatiens, purple daisies, and blue hydrangeas :-) I also love ornamental grasses. I have to say Dumbarton Oaks, hands down. (http://www.doaks.org/gardens/virtual_tour/ggr_virtual_tour_07.html) I've been to lots of other famous gardens but there's just something about it that really speaks to me... It feels neoclassical and a bit secret, hidden in the middle of Georgetown. ALl of the plants/ trees are so mature & it smells so wonderful!!!! I never want to leave when I'm there!! These gardens are all so lovely, each in its own way. I think it is the color of grey and green that feels so inviting, peaceful. The St. Tropez garden is so spectacular, its wonderful view which is hard to beat, however, that first garden speaks to me because of its simplicity and the unique water fountain - so simple and elegant. I love the view through the arbor of the ocean! Lovely images. I love how you set up the images on this post! Your blog just gets more beautiful every day! We honeymooned in Victoria so my favourite garden is the Butchart Gardens. I would love to spend some time relaxing in any of those gardens. They are very well edited, each image has a strong focal point and comfort is not only in the furniture, those images have a visual comfort that invite you to be there, but yet they are so elegant. The work of Wolternick in the exterior reminds me Piet Boom work in the interiors. I just adore all of this indoor/outdoor living. Each time I travel somewhere vaguely tropical where the local style tends towards those open air living rooms and the like, I just want to move somewhere that is perpetually warm. What a beautiful post, Patricia. Such a lovely way to begin what promises to be a gorgeous weekend here in the northwest (a rarity anymore). Hope you can enjoy it too! I am in a condominium, so clematis climbing up a wire tower by the front door, and on the deck three beautiful mandevillas that will twine around the wrought iron balcony. I consider the deck an extra room most of the year! I make it as comfortable an inviting as possible. if I had no garden, I definately would have a grand terrace. I don't think I could function well without also creating outdoors, my garden is softly coloured and has a heavy touch of Provence ( it is possible in mid Sweden, but for a shorter season). I am very fond of Portugal too, even if it has a little more barren landscape. Wow. You totally sold me on the book and the design philosophy. I am an avid believer in the seamless integration of indoor and outdoor space and the pictures say it all. I don't have a favorite garden but I am fascinated by reclaimed gardens. There is a huge movement in DC to reclaimed green space. I love that residents have been lawfully reclaiming the unused public space in their neighborhood to create garden sanctuaries very close to their limited/nonexistent backyards. Nothing more delightful than finding a garden where you least expect it--whether it's in the marginal medians of a crowded city or a sprinkle of rooftops in a metropolis. Seeing that photo of the figs makes me want to eat some. All the photos are great! What makes a garden special to me is when it glorifies nature and when in doing so welcomes animals and humans. In photographs of gardens i look for an inviting place to repose and bird feeders, fish ponds, frog pools, dog water bowls...something that welcomes animal life. The sights and sounds of birds, butterflies, animals makes a garden alive. Without the animal aspect evan a garden can seem sterile. The New York Botanical Garden is such a beautiful place, the only problem most people have it's the location, the Bronx is not everyone's cup of tea. I hope that you will make it there one day and experience it's beauty. If you add some metal element, what will be like? I am desire for it.